Win a Microchip BM64 Bluetooth Audio Evaluation Board (BM-64-EVB-C2) from Electronica Azi International. This board enables easy development with Microchip’s new IS206X of SoC devices and modules which offer Bluetooth Low Energy (BLE) capability. Uniquely engineered for speakers, headsets and gaming headphones, the IS206X flash-based platform offers flexibility and powerful design features, allowing audio manufacturers to easily incorporate wireless connectivity in streaming music and voice command applications. 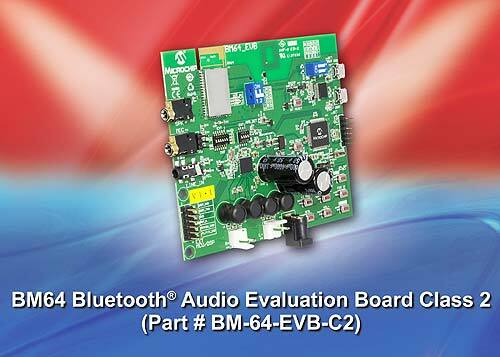 The BM64 Bluetooth Audio Evaluation enables the user to evaluate and demonstrate the functionality of the BM64 Class 2 stereo audio module. The BM-64-EVB-C2 includes an integrated configuration and programming interface for plug-and-play capability, and also has status LEDs which enable rapid prototyping and faster time to market. For your chance to win a Microchip BM64 Bluetooth Audio Evaluation Board, visit www.microchip-comps.com/e-aziin-bm64 enter your details in the online entry form.